… small farms have multiple functions which benefit both society and the biosphere, and which contribute far more than just a particular commodity—there is ample evidence that a small farm model for agricultural development could produce far more food than a large farm pattern ever could. This paper address some issues and options in the operation and organization of small and family farms, including their natural resources, enterprises, farming methods and techniques, rural development policies, family labor use, new organic practices, latest farm-related innovations, comparison of large farm versus small farm operations, family farm definitions, garden tools and farm machinery, and other farming-related practices. The two main objectives of this paper are: (1) to emphasize the important role that operators of small farms and family farms will have during Cuba’s transition and the future economic, social and political development of rural areas and their participation in modeling civil society in the countryside and in rural communities, and (2) the importance of developing a nation-wide agricultural network integrated by operators (owners and non-owners) of small farms. Basically, we are referring to members of the National Association of Small Farmers (ANAP), non-ANAP members who presently are members of the Cooperatives of Agricultural Production (CPA) and of the Cooperatives of Credit and Services (CCS), and independent small farmers. To facilitate the design and implementation of agricultural policies we suggest that the agricultural sector be divided into several interrelated sub-sectors with dynamic and strong backward and forward linkages. Of course, there is some overlapping and intertwining of these sub-sectors, which together constitute one of the most important segments of the economies of most Less Developed Countries (LDCs). In this paper, family farms, small farms and campesino farms (peasants units) are considered together as part of the small/traditional production sub-sector. Small farms are defined by Steel (1997) as farms with sales under $20,000 per year, consistent with the definition in the Food and Agricultural Act of 1977. They represent 60% of all farms, 4% of all U.S. sales, and 20% of hay and tobacco sales. Small farm operators purchased 11% of non-capital goods and 22% of capital goods within the farm sector. They held 39% of farm assets and 18% of farm debt in 1994. In addition, smallholders payed 24 % of real estate and property taxes within the farm sector, thus adding to local government revenue, and owned 29% of U.S. agricultural land held by farmers. Trends suggest that small farms will continue to produce nontraditional crops, also called specialty crops. The Economic Research Service (ERS) classification defines “family farms” as farms organized as proprietorship, partnership, and family corporations, excluding farms organized as non-family corporations or cooperatives, as well as farms with hired managers. Such farms with sales up to $250,000 are still called small family farms, while family farms with sales between $250,000 and $499,999 are called large family farm, and those with sales over $500,000 are called very large family farms. Gross value of farm sales is an indicator of economic size. It measures what the farm sold during the year, including sales from inventories, regardless of weather the proceeds were received by the operators, landlord( s), or contractor(s). It includes any and all cash sales of all farm products. For purposes of U.S. Census statistics, farms with gross value of sales under $50,000 are referred to as noncommercial-size farm businesses, while farms with sales over $50,000 are called commercial-size operations. Other farm-size measuring sticks, besides total farm area in hectares (ha.) used commonly in the literature and in this paper are: the total value of farm assets and the annual farm net income. Family farms are those run by the farmer and his family without hired help. The ideal family farm operators are those who were raised on the farm, learned of what they know from their ancestors and willingly have self-committed to improve the way of living in the farm and use the latest technological advances and innovations in crop and livestock raising. In general, family farms should be self-sufficient, except for specialized farms (e.g., tobacco farms in Cuba). In most LDCs small farms are central to the production of staple foods (this is also the case in Cuba). Small farms have been described as technically-backward, unproductive and less efficient than large farms, which are technically advanced and heavily mechanized for large-scale operations, accounting for higher crop yields per unit of land and total farm output. Peter Rosset, an international expert in small farm operations, claims that small farms have multiple functions that benefit both society and the biosphere and contribute far more than just a particular commodity. Cuba is a good example where thousands of campesinos vigorously resisted the land socialization drive of the Castro regime and used traditional cultural practices that reduced soil erosion and degradation of the Cuban ecosystem. • Consolidate the system of private property. • Diversity: Small farms embody a diversity of ownership, of cropping systems, of landscapes, of biological organization and biodiversity. • Environmental benefits: Responsible management of the natural resources of soil, water and wild life. • Empowerment and community responsibility: Decentralized land ownership. • Places for families: Family farms can be nurturing places for children. • Perception: Small farms are not really a significant part of American agriculture. Government farm programs for many decades have been exclusively concern of increasing production rather than people. Reality: Small farms make up about 60 percent of all farms, according to the 1992 Agriculture Census. • Perception: Small farmers are not real farmers; they are just part-time or hobby farmers. Reality: More than half of these farmers spent most of their time at the farm, which is considered his or her residence, and farming is their main occupation as reported in the agricultural censuses. • Perception: A family cannot depend on a small farm for a significant part of their living. There is not way that a farm with gross sales of less than $50,000 a year can be a serious commercial operation. Reality: A small farm can support a family. Successful small farmers pursue a fundamentally different approach to farming than do big business. • Perception: Technologies are scale neutral; the only way small farmer can succeed is for it to grow larger. Reality: Technologies are not scaleneutral. Industrial technologies were developed for larger commercial farming operations are not appropriate for small farms. In economic analysis, efficiency provides a “measuring stick” for evaluating choices. Efficiency refers to the ratio of valuable output to valuable input. One technique or a package of resources is said to be more efficient than another when it produces a greater valuable output per unit of valuable input used. From an economic standpoint, efficiency is desirable (Bishop and Toussaint, 1996, p. 26). • Multiple cropping, probably multiple planting times per year, and more likely inter-cropping various crops on the same field, while large farms almost always use monoculture. • Intensive land use, using their entire parcel, while larger farmer leave some of their land idle. • Emphasis on resource-intensive use of land. • Family labor personally committed to the success of the farm. • More input per unit area, particularly of nonpurchased inputs like manure and compost. 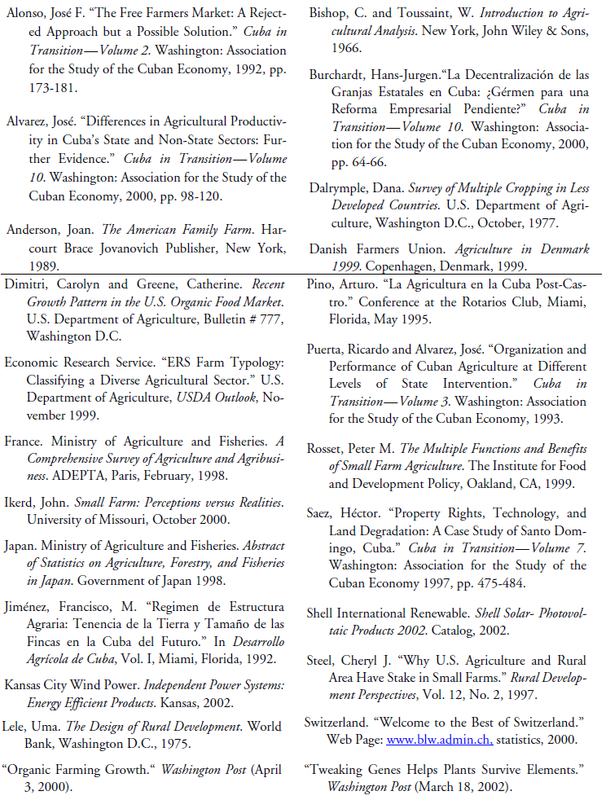 Puerta and Alvarez compared productivity in Cuba of state farms (very large farms) versus non-state farms (small dispersed private farms and relatively small farms organized as pseudo-cooperatives by the state, namely in Cooperatives of Agricultural Production (CPA) and Cooperatives of Credit and Services (CCS)). They used yields as the measuring stick to determine productivity. They also took into consideration the degree of access to agricultural inputs and farm-related services and credit by the two sectors (Puerta and Alvarez, 1993). They selected four major groups of crops: viandas (roots and tuber crops), vegetables (tomatoes, peppers and onions), grains (rice, corn, beans) and the main Cuban exports crops, sugar cane and tobacco. They tested their hypothesis and, even with the lack of complete data, concluded that the non-state sector produced more, with better quality, than the state sector when given the right incentives (Puerta and Alvarez, 1993, p. 117). • For vegetables (called more-perishable commodities in the new study), non-state growers of onions and peppers outperformed state farms; however average yield of tomatoes for the non-state farm sector were below those of state farms. Tomatoes are a very popular vegetable in Cuba and are easily swapped with other farmers and sold directly to final consumers. Hence it is likely that the figures reported by non-state producers to Acopio (she state purchasing agency) understate actual production. • For viandas (called less-perishable commodities in the new study), the results were mixed, with yields from non-state producers were slightly higher for potatoes, which probably require refrigerated storage before distribution, and lower for sweet potatoes than state producers. A large difference in yields was observed in malanga, were yields for state producers were 40 percent higher than for non-state producers. As explained by Alvarez (2000, p. 103), viandas do not spoil soon after harvest, thus farmers can hide them from Acopio. • For grains, since rice is grown in large farms using heavy modern mechanization and advanced technology, it was expected that yields from state farms would be higher than those obtained from small farms and this was the case. Also, yields were higher in the production of corn and beans in the larger state farms than in small farms of the non-state sector. • For export crops sugar cane and tobacco: Nonstate farmers growing sugar cane out-produced state farms in all seasons and tobacco growers did the same, except in one season when their yield were slightly lower. My personal explanation for these differences, in addition to those explanations given by Alvarez, is that the majority of small farmers not only in Cuba but also in most LDCs, use intercropping practices growing a variety of other crops between the furrows of planted corn and beans. This practice involves the sowing or planting of a second crop between the rows of the first crop before it is harvested. Thus the crops’ cycles may overlap for a short period of time, says a few weeks (Dalrymple, 1977, p. 3). When crop yields are used as the only measuring stick to determine farm productivity, large farms in developed countries show to be more productive than small farm, because the yields in their monoculture practices without competing with others planted crops are higher than the yield of the same crop in small farms. However, small farms produce a larger value of output per unit of land even if their yield of the principal crop is lower because of their labor intensive practices and better utilization of the land resource by planting a variety of cash-earning crops. Alvarez (2000) concludes that the new study corroborates results obtained in a previous study made by Puerta and Alvarez (1993) that “as State intervention decreases over agricultural production units, the quantity and quality of output increases despite a decreasing access to factors of production and other resources” (Alvarez, 2000 p. 106). In most industrialized countries, trends of increasing large mechanized farms, producing higher yields per unit, have been observed in the last three decades of the twentieth century. There is also a favorable sentiment toward small farms, whose cultural practices protect the ecosystems and the rural landscape of the country, thus pleasing the increasing tourist industry of all these countries. • In the United States, small farms with less than 20 ha, still accounted for 30 percent of the total number of farms. • Japan, with only 10.6 percent of arable land, the lowest percentage in the industrialized countries, had 59 percents of its agricultural units in very small farms, with 86 percent having less than 20 acres. In addition, Japan had 769,000 noncommercial farm households (those with annual sales of less than five thousand yens) not included in their statistics. Rice production represented 26 percent of agricultural gross income, and vegetables 23 percent. • Swiss agriculture is characterized by small holdings that should be able to supply the nation’s food needs in case of an emergency and should protect the landscape. As a result of tourism, the Swiss have discovered their own landscape and the farmers have thus become landscape gardeners. • Denmark’s agricultural land accounted for about 60 percent of its total area of approximately 4.3 millions ha. The average farm was around 45 ha. with 67 percent of the farm holdings between 5 and 50 ha. About 91 percent of Danish farm holdings are operated by owners. Most of the farms are mixed operation growing grains, forage and vegetables, mixed with raising poultry (meat and eggs), hogs and cattle (both beef and dairy cows). Organic farming in Denmark has increased considerably during the last few years, from 677 organic holdings in 1994 to 2,228 in 1998 (Danish, 1999 p. 74). • France is the largest producer of agricultural products within the European Union and the largest exporter of processed food products. Farm operators and their families accounted for 90 percent of the active agricultural population. Small farms between 5 and 20 ha. accounted for 37 % of all farms. Mechanization, land re-allotment and industrialization have lowered the number of farms in the last few years. • Rough estimates of the number of small farms in Cuba for year 1997 by the author put it at about 275,000 agricultural units2 operated by small farmers, members of the National Association of Small Farmers (ANAP), private dispersed farmers, and farmers who are members of CPAs and CCS. This represents an increase of almost 250 percent from the 111,278 farms of less than 25 ha reported in the 1946 Agricultural Census. This increase in the number of small farms is explained by the subsequent division and fragmentation of larger farms into smaller ones that were distributed among relatives and extended family members of the original owners of larger farms (Puerta and Alvarez, 1993 p. 93), and by the implementation of the agrarian reform acts enacted by the communist regime. Conventional agriculture, or industrial farming, relies upon the proper application of synthetic chemicals in the production of agricultural products, both crops and livestock. When combined with the use of modern methods of irrigation and large farm machinery, conventional agriculture increases crop yields, reduces labor utilization and decreases crop cost per unit of output produced (economies of scale). There are several major classes of chemical inputs in conventional agriculture: (1) pesticides—these are basically: insecticides, fungicides, and herbicides; (2) chemical drugs used in the treatment and control of livestock diseases and parasites; (3) antiseptics and disinfectants used in general sanitation control and regular household and farm buildings cleaning; and (4) chemical synthetics used in both plant food and livestock feed. • Improves soils by adding compost and mulch, which feeds a system of naturally occurring bacteria, fungi, earthworms and other organisms that make nutrients available to crops. Loose organic soils promote root growth, and holds more water. • Plants grown organically may be healthier and therefore more resistant to diseases and pests. Pests outbreaks are controlled by mechanical and biological methods. • Weeds are controlled with mulch, mechanical tilling or cover crops, which hold and fertilize soils and provide habitat for beneficial insects. • Animals have access to outdoors and are fed organically- grown feed. Organic cropland in the United States doubled between 1992 and 1997, to 1.3 million acres. During the 1990s, organic farming was the most rapidly growing segment of agriculture, with sales up over 500 percent between 1994 and 1999 (Dimitri and Greene, 2002). Sustainable agriculture is defined in the U.S. Food, Agriculture, Conservation, and Trade Act of 1990 as an integrated system of plant and animal production practices that over the long term, satisfy human food and fiber needs; enhance environmental qualities and the natural resource base upon which the agriculture and the economy depends; make the most efficient use of nonrenewable resources of farm resources; integrate where appropriate, natural biological cycles and controls; sustain the economic viability of farm operations; and enhance the quality of life for farmers and the society as a whole (Steel 1997). Sustainable land use is an opportunity to improve the quality of the environment, increase soil fertility, better quality air and water. Sustainable farms must be environmentally sound and socially acceptable. For instance, plowing up and down a hill that causes your soil to wash out into public roads, is not environmentally sound, and losing a lot of healthy soil is neither economically sound nor is it socially acceptable because every body must pay for the cost of cleaning (external diseconomies). USDA Organic Standards include: (a) some pesticides and fertilizers are prohibited at least three years before harvest; (b) crop rotation required to avoid pest and disease outbreaks; (c) sewage sludge and genetically engineered products prohibited; (d) soil managed through tillage and supplemented manage with plant waste, composted, animal waste and permitted synthetic materials; (e) organic seeds preferred, but some non-organic seeds and planting stock allowed; (f) pests, weeds, and diseases controlled with physical, mechanical, and biological controls; some synthetic substances allowed; (g) animals for slaughter are raise organically from birth, eat organic feeds and allowed access to outdoors, including access to pastures for ruminants; (h) hormones and antibiotics prohibited; vaccines allowed; (i) poultry must be raised under organic management from no later than the second day of life. Our proposed “ideal” family farm for Cuba would be a general mixed farm of around two caballerías3 (27 ha.). This is based on historical facts—such as that about 70 percent of the total number of farms in the 1946 Census were 25 ha. or less, and all farms expropriated in 1959 (those over 30 caballerías), were to be distributed to peasant farmers on the basis of a “vital minimum” of two caballerías (27 ha.) per family. The size of a family farm could vary depending on location of the farm and the quality of the natural resources, such as abundant source of quality water, amount of cultivable land, relative fertility of soils, and other important farm characteristics. A family farm should comprise mixed enterprises— both crops and livestock raising—in order to minimize risk and generate a weekly or monthly steady cash flow to pay for purchased inputs and the household necessities. Profit, however, should not be the principal goal of the farm. It should be to reach a high level of living and the maximum satisfaction of each family’s values. The first task of a small farmer should be to prepare an inventory of all his natural resources and assets. The farmer should draw a simple map dividing his farm in fields according to type of soil (slope and color), if possible taking two or three samples of each type and have them tested either by the government or using a laboratory kit. The farmer should begin to develop a budget for the next season or calendar year, based on last year’s activities and new ones he may want to start as new business. It is important not to forget to account for the use of family labor, for the utilization of agricultural inputs by crop and animal enterprises, and their respective crops yield and product outputs and sales. The farmer should also check for water availability for animals, household use, vegetables gardens, and irrigation. • Main enterprise—cash earner—is chicken for meat. One thousand birds every eight weeks. This includes time for cleaning and preparing poultry houses for the next batch of baby chicks. • The farmer needs a detailed plan for planting field corn to provided about 50 percent of the total feed needed to grow 6,000 birds per year. (You actually can grow eight flocks per years, if chicks and feed is available.) In addition the farmer will need to grow more corn to feed other livestock, like a dairy cow, a sow, layers and other animals for farm income and for self-consumption. Open-pollinated corn is desirable, because it usually has more nutrients than hybrid corn and seed can be saved for replanting; the new genetically modified seeds will save a lot of money on unnecessary purchased pesticides. Intercropping with corn could be beans, peanuts, or other legumes. • Some hectares should be planted to permanent crops, such as tropical fruit trees (mangos, avocados, sour sops, cashew nuts, tamarind, guavas and citrus fruits like oranges, lime, grapefruit). • Several hectares should be planted to root crops and tubers, like malanga, cassava, sweet-potatoes and some potatoes, and one or two hectares dedicated to plantains and bananas and perhaps planted with fruits in great demand for export, like papayas and pineapples. • In an area around the farm house, the farmer and family members should prepare raised beds to grow vegetables including, tomatoes and strawberries for selling fresh to the tourist industry, special consumer stores or local markets. Some of the vegetables and fruits may be canned in jars and some fruits processed into jams and marmalades. • A portion of the land should be dedicated to pastures and others to fallow or planted to grass, according to a predetermined rotation plan. • If desired, a section of the farm of few hectares could be set aside, dedicated exclusively to the production of organic crops and livestock. Proper certification from the Department of Agriculture of the United States would be required if exports to that country are planned. • Water supplies should be constantly checked for availability, especially during the driest months of the year. All the above activities should be included in a budget plan to be presented to the credit institution that will finance farm input expenses, feed, veterinarian services, custom machinery services, and handling and transport of harvested products. The farmer might also need financing for buying a small tractor (usually 30 to 35 H.P for a small farm) or draft animals (that return to the soil over 60 percent of their ration and forage). For the preparation and maintenance of the raised beds and other manual-tilling operations, a roto-tiller is commonly used. There is nothing wrong with using draft animals: the Amish, for example, is a successful agrarian society that uses draft-horses in the United States. Draft-oxen can be very useful in small farms and may be more economic for some jobs than tractors. The Amish succeed by having low input costs, minimal needs and a strong support network of family, friend and neighbors. A family farm is expected to generate revenues almost every year sufficient to sustain the farmer’s business and household expenses and pay contracted debts. Any revenue left after all expenditures are met should be used for the family recreation and education of the children and young teens, and to invest in farm improvements such as better sanitation (including water supplies for the house and farm, if is not currently available), purchase of manual tools and farm implements and machinery, draft animals or a small tractor that can be used 12 months of the year, or purchasing young animal stock to increase the number of animals for milk or meat on the farm. Why raise animals? Diversification spreads risk. Chickens and cows provide food for the household; additional dairy cows or layers for egg production can generate products for sale. Multi-species grazing—cattle, goats and sheep all together grazing in the same lots—increases land carrying capacity; parasites that affect one species usually do not affect the others. All small family farm operators should consider some value added activities such as: canning fruits and vegetables, preparing jam and marmalades, packaging selected fruits and vegetables with stickers pasted on them with the farm’s name (product differentiation), packing eggs in boxes, making white farmers’ cheese, etc. Small farmers in Cuba have excellent experience and skills in growing crops, but it seems that some of them lack both qualifications in operating livestock enterprises. Municipality of Santo Domingo, Province of Villa Clara: The farmer, 65 years old with 30 years of farming experience, was a beneficiary of the first Agrarian Reform Act. He operates a 7.5 ha farm, producing peppers, tomatoes, corn, cucumbers, and different varieties of squash. He practices multi-cropping production, reducing the sensitivity to pests and increasing the soil fertility. Crop variety spreads his risk of crop failure. He owns fowl and two oxen. His farming skills improved by reading a self-study book on soil and farming. His four-inch turbine pumps underground water he uses to irrigate all of his land. He is very careful, irrigating slowly to maximize water absorption and at the same time minimize run off and thus erosion. He constantly rotates his crops, uses nitrogen-fixating crops serving as green manure. His rotation and intercropping patterns are closely associated with his fertilizer and pest control needs. He has used urea and chicken manure as fertilizer. Apparently the application of chicken manure requires a very labor intensive process of soil preparation. Fields treated with chicken manure are left idle for two years; the farmer believes that fields treated with chicken manure do not need fertilizer for up to five years. He also fertilizes his field with cachaza (a sugar by-product), crop residues, and tree debris (Sáez, 1997, p. 478). Municipality of Santo Domingo, Province of Villa Clara: Another campesino in the same geographic area specializes in the production of fruits. This farmer started as a producer of mangos and oranges. However, because after planting there is an eight-year wait for the trees to start producing fruit commercially, the farmer’s father started grafting locally-improved varieties of mangos, orange, and avocados and sold young trees locally. The farmer has a variety of fruit trees such as cashews, custard apple, papaya, mamey, sweetsop, guavas, grapefruits and other tropical fruit and trees. There are 12 family members living on a 27-hectare farm. He has a 6-inch oil-powered turbine that is not in use because of lack of fuel. He uses his tractor for cultivating between mangos trees and for mixing the soil with organic debris, improving its moisture and fertility (Sáez, 1997, p. 479). Municipality of Santo Domingo, Province of Villa Clara: This is a farmer who uses organic fertilizers. He lives in a 3-ha. farm inherited from his father, who was a beneficiary of the first Agrarian Reform Act. His brother’s family, daughters, sons-in-law and grandchildren live in two other houses at the edge of the farm. He produces more than forty products in this little farm. His rotation sequence is based upon planting a nitrogen-fixing crop (e.g., beans) or one that leaves large amounts of residues (e.g., rice), before planting a demanding crop (e.g., corn). He uses an alley distribution with crops in between lines of planted trees, and also a mosaic pattern, with fruit trees on one quadrant, livestock on another, annual crops on another, and variety of vegetables in another. A dirt road divides the farm into two halves with fences made of cacti (Sáez, 1997, p. 478). Güira de Melena, Province of La Habana: Small farmer owns a 7 ha. farm. He grows mainly grapes for the tourist sector combined with many other crops sold to the state procurement agency. He has an area devoted to growing food crops destined to self-consumption and that of his eight permanent workers, to whom he pays 15 pesos per day, in addition to their food crops’ share. He also makes wine at the farm. He belongs to the local CCS in order to gain access to agricultural inputs; otherwise he would not be a member. He stated that he likes the concept of a free market but without eliminating the price guarantee offered by the State. In that way, he would not be completely exposed to the vagaries of the market (Alvarez, 2000, pp. 162-163). • Small farms are more productive than large farms in most countries, including the United States. The value of total output per unit area composed of several crops and various animal products is greater than the value of the output per unit of large monoculture farms producing a single commodity. • The small/traditional production sub-sector, is a reality, with over 250,000 small producers operating over 25% of the total agricultural land in Cuba and constituting a powerful and dynamic force to exert great influence in the economic development of the Cuba of the future. • There is ample evidence that the non-state sector, particularly the small independent farmers, have substantially demonstrated their farming skills and capacity in producing larger output per hectare of food crops than their counterparts in the state sector. • There is also evidence to affirm that small farmers in Cuba, using traditional cultural practices, had substantially contributed to the preservation of national resources, in contrast to the degradation caused by large state farms that used poor management and poor farming practices of mono-cropping, combined in many cases with excessive irrigation leading to water logging and increase in the salinity of soils. Keeping inflation as low as possible by responding quickly to credit incentives and increasing production of food crops at reasonable prices. • They will also make contributions to local economic activities in rural communities by buying farming and construction materials, garden tools and agricultural inputs from local merchants. • They will slow down the rural migration to large cities by staying in their farms and in this way mitigating the critical scarcity of urban houses. • They will also strength the feasibility of rural development programs, initiated at the national or regional level, with their vigorous active participation in these social and economic programs. Our principal recommendation is the development of a nation-wide network—integrated by all small farm operators, independent private producers, and members of ANAP, CCS and CPAs—for the purpose of maintaining them constantly informed about market activities and policies enacted primarily to foster farm businesses, providing technical assistance, and promoting in rural communities economic, social an cultural developments. The organization and operation on a Small Farmer Network (SFN) is discussed in an Annex. A second recommendation relates to the provision of agricultural credit to stimulate a rapid increase of food production from the small farmer sub-sector. This is almost a universal recommendation: Arturo Pino, an experienced credit specialist, believes that the prompt granting of credit requested by small farmers is the right way to quickly increase the availability of all types of food crops in the nation. He proposes a simple credit application form, together with the farmer’s personal signed promissory note, to accelerate the credit process (Pino, 1995). I absolutely agree with the above recommendation, but I believe it is imperative that the credit applications should indicate approximately the expected transportation costs and proposed schedule of deliveries to specific markets. • Expand current poultry processing capacity and build new plants. • Increase table oil extracting capacity by building new plants, in addition to the one in Santiago de Cuba, to extract oil from peanuts and imported soybeans. If we have to import vegetable oil, it is a better economic decision to import the raw material, soybeans, process it locally and use the main byproduct, soybean cake, for poultry and other livestock feed. • Other processing plants that need capacity expansion are feed mixing plants and storages facilities with refrigeration for perishable vegetables. Other storage facilities for non-perishable agricultural products probably need to be reconstructed or new ones built. Rice, and other grains are harvested when their moisture content is relatively high; for safe storage, they must be dried artificially and then stored. This is done at the farm level in large rice farms, but commercial facilities for storage of small volumes produced in small farms probably would be needed. Fourth, promote organic agriculture among small farmers to diversify their annual income. The provisional government or the SFN should conduct a survey among hotels and restaurants serving the tourist industry to determine the demand for organic products. The results should be made available to interested farmers, and they should be provided with proper training and education in some practical techniques and farming practices specific for organic production of crop and livestock products. Fifth, stimulate small farmers to produce more livestock products. Livestock turn grasses into high-quality protein for human consumption. By covering more soil with long-term grasses for livestock, the livestock feed themselves and at the same time the grasses improve the environment by reducing soil erosion. Some incentives, like better credit terms or special sales of breeding stock to small farmers just starting livestock enterprises would be positive steps. Sixth, creation of an autonomous institution for stabilizing the rural property market. France created SAFER, a rural property development and settlement company for the purpose of safeguarding the family nature of farms by preventing rural property speculation. SAFER buys land or farms for sale and resells them after having outfitted them, if needed. It also handles regrouping plots or parcels belonging to the same owner to increase farm size. A similar institution in Cuba could administer the creation of a “Land Bank” composed of land donations from former owners or cash from donors, unclaimed land located within state farms, and farms under litigation provided the litigating parties agree to give up their legal rights in exchange for other state property or compensation. This nation-wide register of all potential interested independent small farmers and those associated with pseudo-cooperatives, is estimated to include over 250,000 producers operating over 25% of the total agricultural land in Cuba. There are several components in the organization, functioning and implementation plan of the SFN that should be considered after the transition government has established its initial political, economic and social preliminary programs, including addressing the nation’s immediate critical priorities. Hopefully, one of these priorities will be the preparation of a short-term plan to quickly increase the supply of staples and other food products to feed the deprived Cuban population. The SFN should be a computerized national data base system. The system should be designed by an experienced and credible international software company with the highest technical expertise and willing to do the job at a reasonable cost. It should register, beginning with ANAP members, each small farm in the country, by municipality and province, assigning each farm an specific geographical code, the name and address of the farm, and the name of the head of the family owner or operator. All information registered in the SFN should be available to the public, probably for the payment of a nominal fee, except for small farmers who will be able to access it without charge. Small farmers will register all crops grown, their yields, area planted and number of animals raised by species, family laborers by age and time availability, and any other information they would like to provide. Data from the SFN may assist small farmers in preparing their annual farm budget, in calculating cash expenses, yields, and income from cash sales, etc, and more generally in determining their approximate credit requirements, including household expenses. Technical input into the system should be provided by professionals from the Ministry of Agriculture, credit specialists, commercial providers of inputs, processing industries, local agricultural authorities, marketing specialists, and officers from the Planning Board, the National Bank and the Armed Forces. The farm data contained in the SFN will represent nearly a complete enumeration of all small farms in the nation. It will be relatively easy for statisticians to draw samples with a high degree of confidence for specific analyses. Large farms also could be registered in a separate data bank under the umbrella of the SFN to complete the national agricultural data needed to conduct national sample surveys, whenever they are needed, as well as a data source for microstudies such as specific commodity cases studies. In addition to the farm data, the SFN may register, for a fee, all interested national and foreign companies, partnerships and individuals supplying agricultural inputs and services, agricultural processing industries buying raw agricultural products, and enterprises involved in exports and imports and other related businesses to the agricultural sector. The SFN will keep constant communication with local membership (campesinado) to inform them about prices, new markets for value-added products, demand from the tourist industry, etc. 1. Agricultural data from farmers credit applications made at government and private banks would be transferred, after being authorized by farmers, to the local SFN office in order to update already-registered farms or register new ones. This important component should be monitored by the National Bank or the Agricultural Credit Agency. 2. The technical research and technical farming guidelines will be developed by agricultural engineers, veterinarians, and other professionals of the Ministry of Agriculture as well as consultants from international organizations and technical experts from developed countries. The representative of the SFN at the local level will deliver technical assistance directly to farmers through regular and special meetings, distribution of farm publications, showing of farm movies, presentations and lectures about specific farming techniques by agricultural experts. The local SFN representative generally will be a graduate from an agricultural technical schools (Maestro Agrícola) or a qualified retired volunteer from government or international organizations. 3. The Armed Forces will provide the manpower to run the computerized network at both local and national level. Work Youth Army (EJT) members could be designated to assist the local SFN representatives in attending to farmers’ inquires, input data into the system, prepare the SFN local offices for technical meetings, showing movies, etc. 4. The SFN will educate farmers about shifting to organic methods, explaining the ecological advantages of this type of farming and the premium prices for both vegetables and animals products. The SFN could assist the Ministry of Agriculture in sponsoring small farmers interested in experimenting with new crops or varieties from other countries until agricultural experiment stations are established. 1. I would like to express my gratitude to Antonio Gayoso for comments and for the presentation of this paper. 2. Author’s estimates derived from information provided in Puerta and Alvarez (1993, p. 93) quoted from government agencies as follows: National Planning Board showed 165,866 private producers in 1961 in a total area of 4.0 million hectares showing and average of 24.1 ha. per farm. However, figures from the July 1965 Census shows 197,207 “private” producers with a total area of 2.69 million ha., or an average of 13.5 ha. per farm. There is a difference of 1.31 million ha. that have not been accounted for. If we assume that the average area remained as it was in 1961 (that is, 24.1 ha. per unit) we obtain 253,790 producers presumably not counted. If the average area per unit established for the 1965 Census of 13.5 ha. per unit is used, then we get and increase of up to 296,234 producers. The mid-point of both figures is 275,012 “private” producers, rounded to 275,000 producers with less than 20 ha. per farm (24.1 + 13.5 = 37.6/2 = 18.8 ha.). 3. One caballería equals 13.42 hectareas.